"Yesterday I got so old. 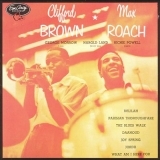 It made me want to cry"
Clifford Brown And Max Roach (this album) (1954). Sorry, no matches on eBay for "Joy Spring Clifford Brown And Max Roach". Related links: top tracks by Clifford Brown And Max Roachtop tracks of the 1950s, top tracks of 1954.